A light-hearted open letter to Jo Theakston, Sales and Marketing Director of Black Sheep Brewery, Masham, North Yorkshire. Thank you very much indeed for sending me samples of your new bottled beer All Creatures (4%). It is very exciting to hear about this new addition to your permanent bottled ale range and I look forward to seeing it stocked in my local supermarket – even if it does mean I will have to go to ASDA for a change. All Creatures – Black Sheep’s first new permanent bottled beer since 2005. I’ve got a confession to make though. I won’t be giving the second bottle to a non-ale drinking friend. First off, I just don’t really have any non-ale drinking friends. I’ve heard that such people exist but they seem not to be the sort of folk I tend to mix with. Secondly, well, I enjoyed it too much to give it away. I know that probably sounds a bit selfish but I do share beer with many people – both socially and when I run tastings – so I hope you won’t mind too much that I’m keeping this one for myself. I’m very partial to a pale ale but too often I find they turn out to be just not hoppy enough so when I tasted All Creatures and smacked my lips round its clean bitterness, which seemed to be pleasantly tinged with a sort of chalky mineral salts flavour (a little like cream soda but without the vanilla sweetness) I tucked the second bottle away somewhere cool so I could enjoy another one. Although obviously it won’t be tucked away for long – in fact I’ll probably drink it tonight. While I’m here I’d also like to say a massive “Well done!” for sticking with dark glass bottles. Far too many breweries seem prepared to compromise the quality of their beer by putting it in clear glass because they say they sell more when people can see it. If the only way they can sell beer is by showing people what colour it is, but in so doing cause said beer to smell and taste like an unwashed armpit, then those breweries need to get some better marketing people if you ask me! As you are clearly aware it’s much better to design a lovely bottle label to stick on brown glass and sell your beer that way – although I would like to see a little more in the way of tasting notes and food matching suggestions on your bottles too. Anyway, thanks again for sending me the beer. It’s jolly tasty and I look forward to drinking not just the second bottle but lots more beyond that. PS. ‘Hats off to your Dad for his APPBG Lifetime Achievement Award – well deserved. PPS. 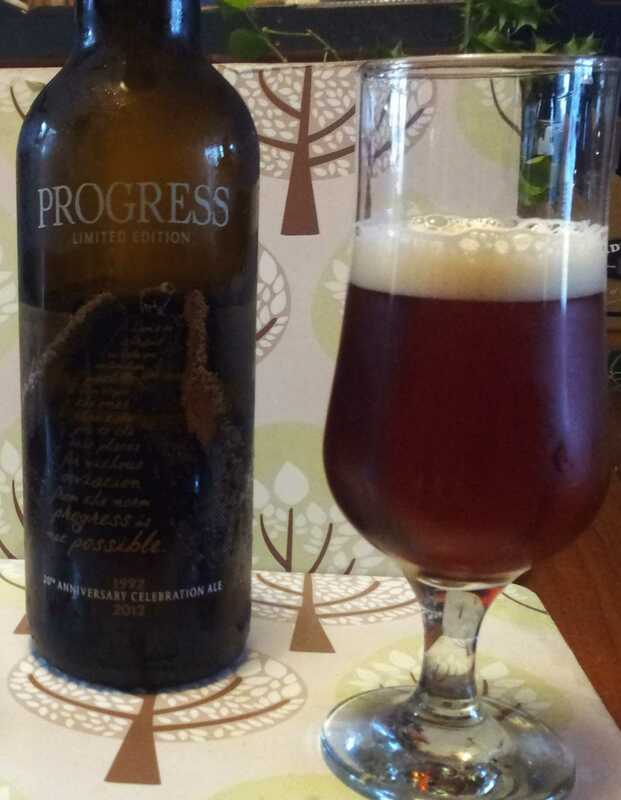 Apologies for not having written about your Progress (10%) 20th Anniversary brew which Beer Husband and I enjoyed during our festive break last December. It was heavenly! A beautiful chestnut/dark amber colour with a creamy head; an aroma of dried, dark fruits and banana; and a moreish, malty fruitcake flavour wrapped up in velvet with a surprisingly dry finish. Any plans to brew it again?! Good to hear that a new bottled beer is going to be available from Black Sheep. I take it from your post that it will only be available in Asda? I also have to agree with you about Progress. I was lucky enough to try this a few weeks ago when friends cracked open a bottled they’d been gifted. It made the weekend, and was impressed to see this come from Masham.